Every detail of this spacious kitchen matters—down to the hidden motorized shades on the supertall windows. 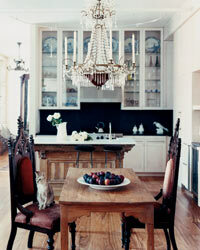 Designing a large kitchen takes just as much creativity with space and materials as designing a small one. “This kitchen is a little bit barnlike, a little bit loftlike—and definitely tailored,” says Rick Livingston of the New York City design firm Period, who customized nearly every element of the kitchen in this Dutch Colonial–style house in New Canaan, Connecticut. The bronze cone-shaped lanterns illuminate both down and up (to show off the knotty-pine ceiling, a majestic 25 feet at its peak). To match the large scale, Livingston expanded the width of the door frames on the white-oak Shaker-style cabinets from the typical three or four inches to eight and added an extra-tall crown molding to the upper cabinets. Attention to small details like these help the spacious room feel balanced. Motorized vinyl shades, essential for supertall windows, are hidden inside the window frames. $1,200 and up from Distinctive Window Treatment Plus; distinctivewindows.com. 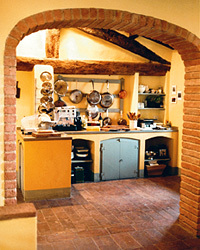 Above the 48-inch Viking stove is a Vent-A-Hood hood liner, which Livingston covered with Venetian plaster. 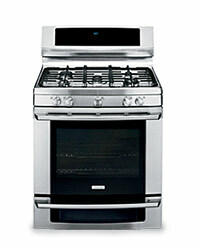 From $7,950 for stove; 888-845-4641 or vikingrange.com. $2,589 for hood liner; 800-331-2492 or ventahood.com.